“El Suertudo,” Spanish for "the lucky one,” is the perfect name for the 61-foot Viking that belongs to Guy Yocom from Dana Point, Calif.
Yocom is also the lucky angler who hauled in a monster yellowfin tuna, which looks to be a shoo in for the all-tackle world record and possibly a $1 million payday. The fish was weighed on two different scales, with local IGFA rep Minerva Saenz present, and registered 421.5 pounds on one and 427 on the other. The scale belonging to the boat was sent off to verify that it is correct and to have the certification checked. Nevertheless, either of these weights would make it a world record. Yocum, a contractor by trade, is also a hard-core angler. Yocum and his crew, headed by Capt. 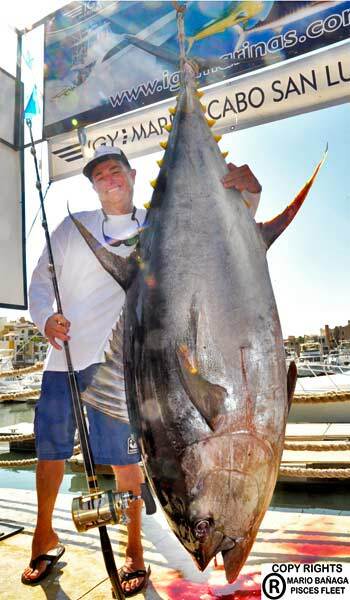 Greg DiStefano from San Clemente, Calif., went out to land a large tuna, leaving Cabo on Saturday, Sept. 15, around noon. "We headed out looking for schools of porpoise,” Yocom said. “Each time we found them we would position the boat in front of the school and bait fish with the kites, using ‘bolitos’ and dead flyfishing. When that didn't work, we switched to drifting with chunk baits." They ended up 180 miles due south of Cabo and landed a 200-pound tuna on Monday, Sept. 17, among others. It was around 10.45 a.m. on Tuesday, Sept. 18, as they were drifting with chunk bait, that the monster fish broke from the deep and Yocom got his hook-up. Being an experienced angler, he worked the fish like a pro and had the yellowfin to the boat and gaffed by the crew in slick 55 minutes. Knowing they had an exceptional catch, they started to head back, reaching Cabo at 8 a.m. Wednesday. Guy sounded exhausted but excited when he was reached by phone and asked about his previous largest fish, a 212-pounder. "My son did get a 350-pounder on the boat last month," he said. The tackle used was 100-pound test line on a Shimano Tiagra reel, chunk bait with a mustad hook, which might just make this catch eligible for the Mustad Hook a Million top prize as the first new IGFA-certified all-tackle world record. The first such catch before Sept. 30 earns $1 million. Another angler, Rodney Ply of Arkansas, caught a world record striper from Bull Shoals Lake earlier, but the IGFA has not certified it as there are questions with his homemade lure. Ply has appealed to the IGFA executive committee.